It’s Mother’s Day, and while I may be biased (aren’t we all), I think I have the best mom ever. She has taught me so much, and continues to inspire me, guide me, and encourage me through all of life’s twists and turns. I wish I could be with her today, but these pesky boards have me walled up in my apartment. (I actually wrote this post last week and saved it for today because I knew I’d be studying). Since I can’t be there to thank her in person for all she’s done for me, I really wanted to send her something in appreciation. I first started with the idea of chocolate-raspberry truffles, which I’m sure my mom would love but they need to be refrigerated and therefore are not mail friendly. Then I thought I’d make toffee, but I made this at Christmas and while it was delicious, it’s way to easy to eat all of it in one day (and then regret doing that). Then I thought about the fact that my mom, like me, is back in school. Speaking as a student myself, sometimes we just need a cup of coffee. I’m personally not a big coffee fan (diet coke is one of my guilty pleasures), but when I’m too tired to turn another page in my notes, coffee has been my friend. 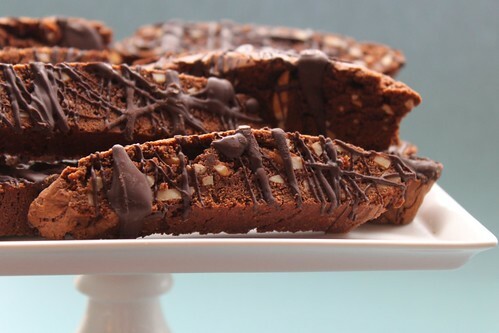 I finally decided on these chocolate almond biscotti because they are perfect for a student, who can enjoy them with a cup of coffee during some late night studying. They also happen to be very mail friendly because they are sturdy and keep for a long time. If you’d like, you can pop them in the freezer and they will keep even longer. 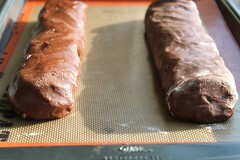 They are also delicious, but not so over the top that you will find yourself sneaking back to eat more and more – they are really best enjoyed dipped in coffee (although my mom loves chocolate, so I can’t really make any guarantees :-)). So thanks Mom for everything you have done for me, and for inspiring me with how hard you’re studying and how much your learning! 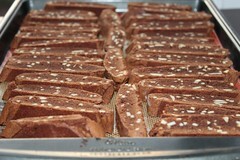 I hope this biscotti make your late nights a little more enjoyable! Happy Mother’s Day to all the moms out there – you are truly appreciated! 1. Preheat oven to 325°. In a small bowl, combine flour, baking powder and salt. 2. 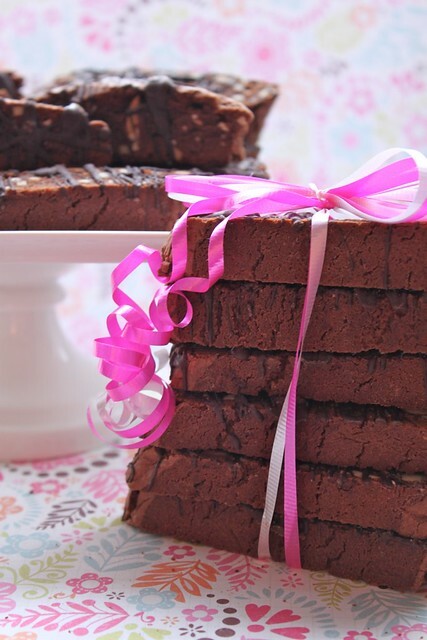 If using chocolate squares, coarsely chop them. 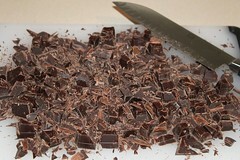 Melt the chocolate in the microwave for 2 minutes, then stir to melt all the pieces. 3. Beat butter and both sugars together on high. Add the eggs and beat well. 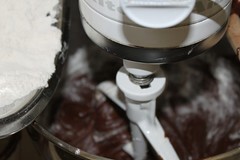 Then add the melted chocolate and vanilla. Slowly add the flour mixture, and mix thoroughly. 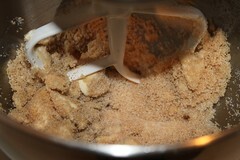 Add the slivered almonds, as the last mix in. 4. Transfer dough to a floured surface and divide into 2 equal pieces. If the dough is too sticky, add a bit more flour. 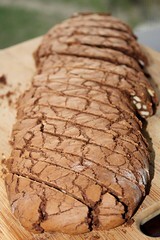 Roll each piece of dough into a log about 10 x 2 inches, and place on a baking sheet about 3 inches apart. 5. Flatten the rolls slightly by pressing down on them with a spatula. Bake at 325 for 40-45 minutes. 6. Remove rolls from oven and allow to cool for 15 minutes. Then transfer to a cutting board and cut each roll diagonally into about 16 pieces. (*A very sharp knife worked better than a serrated one for me). 7. Lay pieces back on the baking sheet, and bake (still at 325°) for an additional 20 minutes. 8. 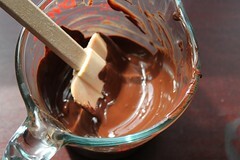 Finish by drizzling with melted chocolate if desired. Store in an airtight container for up to 2 weeks or freeze for future use. This entry was posted on May 8, 2011 by Spice Is Nice. It was filed under Bar Cookies, Dessert . Thanks for stopping by my blog, Jacqueline! 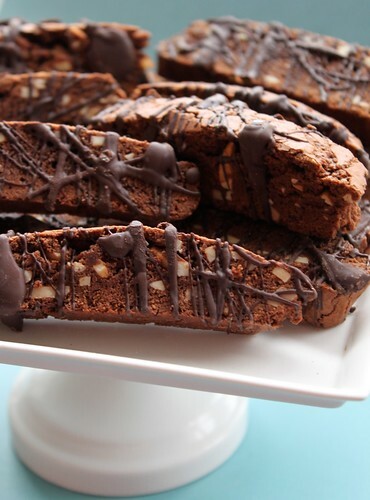 Your biscotti look fantastic! I love making my own, and I really like the flavors you used in these. Your photography and blog are just great, and I’m so glad to have found you! 🙂 Have a nice weekend.